Dr. Animesh Agarwal is a practicing Orthopaedic surgeon, as well as the Director of Orthopaedic Trauma and Professor of Orthopaedic Surgery at University of Texas Health Science Center San Antonio (UTHSCSA), San Antonio’s only civilian Level I Trauma Center. 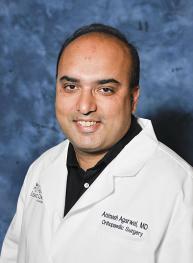 Dr. Agarwal received his Orthopaedics residency training and M.D. at UTHSCSA after earning a B.S. degree in Biomedical Engineering from Johns Hopkins University. Following his residency, Dr. Agarwal completed a trauma fellowship at Grant Medical Center in Columbus, Ohio, and joined the clinical faculty of UTHSCSA in 1997. His research interests include: 1) diabetes and its effects on the musculoskeletal system, 2) fracture healing, 3) biomechanism of cartilage and bone, 4) retrograde femoral nailing, 5) knee dislocations and cruciate injuries, 6) bone graft/filler substitutes, and 7) wound VAC applications.